Brendan Gall and Lesley Faulkner get down to baby business in a play that asks ‘Where do we go from here?’ A touching tale with very little touching, ‘Lungs’ runs until January 25 in the Tarragon Theatre Extraspace. It’s a known fact that the English like to make bets. 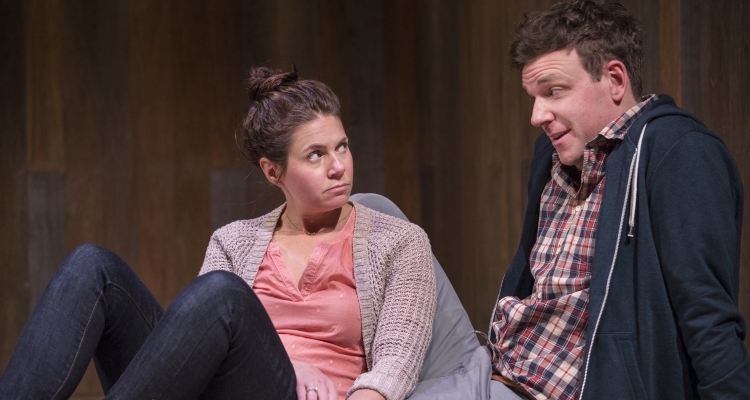 And when Duncan MacMillan unveiled Lungs to North American audiences in 2011, a show he referred to as a ‘strange thing,’ he took a huge gamble with a story lacking a conventional set design, lighting cues and scene changes. Director Weyni Mengesha does not disappoint with a fiery staging every bit entertaining as it is ponderous. And if casual dialogue can be defined as an unsophisticated exchange of ideas to make sense of an opinion, idea or issue, get ready for an avalanche of neurotically humourous banter involving a Gen Y couple and life off the beaten path of romance normality. The fun starts when the only thing more shocking than a monkey wandering around Ikea is talk of family planning. He feels it might be time to look to the future, she requires a bit of persuasion. The biggest decisions need to be made which has playgoers giggly over the complexity of the estrogen enriched species when beliefs/assumptions are challenged. A positive pregnancy test serves as a reminder that a baby on the way changes everything. While Brendan Gall is a shoe-in for this kind of role, he’s the kind of actor that knows how to let a character breathe with conflicted dimension. Yet it’s Lesley Faulkner who exhales the majority of the comical lines illustrating momentous range roving in her latest stage appearance. Together their convictions are sound, their fear is consummate and concentrated awkwardness has never felt so amusing. Let it be said that Lungs isn’t a perfect play but it is a damn fine one. The story suggests that there’s always opportunity to pump new life into a deoxygenated relationship. A healthy dose of cognitive truths that bond a union would give the offering much needed shelf life.